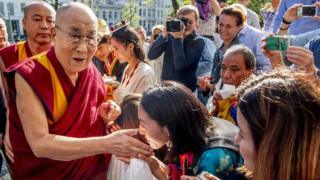 The Tibetan spiritual leader the Dalai Lama is to meet victims of alleged sexual abuse in the Netherlands. The group requested the meeting to discuss abuse reportedly carried out by former or current Buddhist teachers in several countries. “We found refuge in Buddhism with an open mind and heart, until we were violated in its name,” they wrote. A spokesperson said the Dalai Lama was “saddened” to hear about the abuse and “constantly condemned” such behaviour. The victims will present their written testimonies during the meeting on Friday. The Dalai Lama is currently on a European tour.